When I was a kid, it blew my mind when I discovered that you could put things inside a chocolate shell other than, well, chocolate. That the filling in question was delicious Reeseâ€™s peanut butter certainly helped. 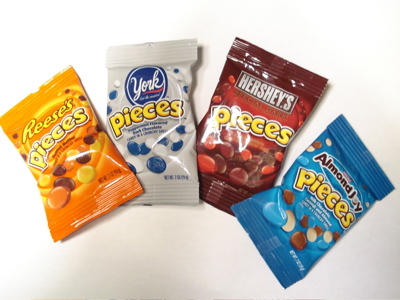 If thereâ€™s anyone out there who hasnâ€™t had them before, Reeseâ€™s Pieces are about the size and shape of M&M’s, and have a similar texture â€“ under the candy coating, the peanut butter filling is denser and smoother than in a Reeseâ€™s peanut butter cup, closely mimicking the texture of the more traditional chocolate. The filling has a milder flavor than a Reeseâ€™s cupâ€™s â€“ without the added element of chocolate, it doesnâ€™t need the same intense saltiness. In all, Reeseâ€™s Pieces are a good mix of contrasting textures and flavors â€“ the sweet, crunchy candy shell and the creamy, mildly salty peanut butter combine for a taste thatâ€™s not too heavy and definitely addictive, and they remain one of my favorite candies to this day. Admittedly, Iâ€™ve never eaten an Almond Joy bar before â€“ the similar but nut-free Bounty bar is more commonly available here in Canada. But I love the combination of coconut and chocolate, so I was pretty pumped for these. They smell like toasty almonds and coconut mixed with milk chocolate â€“ yum. The individual pieces are a little bigger and thicker than Reeseâ€™s Pieces, and their shells look a little lumpy and uneven, without the uniform gloss of the Reeseâ€™s. This is definitely a candy for coconut lovers, as thatâ€™s the dominant flavor here. The milk chocolate is very creamy and mild, and isnâ€™t overpoweringly sweet. It actually does a good job of mimicking the peanut butter center of Reeseâ€™s Pieces, only with the added textural elements of bits of nuts and coconut shreds. The candy shell isnâ€™t terribly thick, but thanks to the almond and coconut bits, these have a pretty substantial crunch. I can see where they might not be everyoneâ€™s thing, though â€“ if the idea of little gritty bits in a chocolate shell doesnâ€™t appeal to you, these probably arenâ€™t for you. I, however, found them just as addictive as the originals. For mass-market dark chocolate, Hersheyâ€™s Special Dark is actually not bad. But much as I love dark chocolate, I have to question whether a Pieces with a straight chocolate center really belongs in the same lineup as the chocolate-free Reeseâ€™s Pieces. The Special Dark Pieces match the Almond Joy ones in terms of shape and texture â€“ theyâ€™re a little bigger and thicker than the Reeseâ€™s, with a less glossy and even coating. Unsurprisingly, they remind me a lot of M&M’s, but I find the chocolate center a bit acidic â€“ it reminds me of semisweet Chipits rather than anything I would want to eat by the piece. Maybe I havenâ€™t eaten enough dark chocolate M&M’s, but I just kind of expect a creamier, richer filling inside a chocolate lentil, especially one thatâ€™s being marketed as a variation of Reeseâ€™s Pieces. Overall, Iâ€™m not a fan of these. They donâ€™t have the fondant, but the dark chocolate filling does have the same intense mintiness of a Peppermint Pattie, plus the slight sweetness and crunch of the candy shell. Not the original taste sensation I was hoping for, but really, you canâ€™t go wrong with peppermint and chocolate, and the texture element of the candy crunch is a very nice addition. Overall, all of these flavors were really tasty except for the Special Dark. I just wish they had been a little less chocolate-focused. None of them really blew my mind like the original Reeseâ€™s Pieces did back in the day â€“ it seems like the purpose of them is just to compete with all the new flavors of M&M’s rather than doing anything truly innovative. There have to be more interesting non-chocolate things that you can put inside a candy lentil â€“ but it doesnâ€™t seem like Hershey’s is trying very hard to find them. I so agree with you! I just had the Almond Joy ones… I wonder if that’s how the coconut m&ms taste? I’m disappointed about the York ones…I love York, they should have a fondant in the center! Did you happen to catch when they’ll be on shelves? Now that my candy supply from the show is nearly gone, I find myself missing some of the stuff I’d tried there–and Almond Joy Pieces rank pretty high up there. Has anyone seen these in the wild yet? I noticed they’re up on the hersheys.com website. I’d like to know what stores are most likely to carry them. I also heard they’re at the Hershey’s Chocolate World Store and imagine they’re also at the Hershey’s Store at Times Square. ahhh! I love the new Almond Joy Pieces!! IMO they are WAY better than the Coconut M&Ms that are out.